How can I use version control to collaborate with other people? Collaborate pushing to a common repository. Describe the basic collaborative workflow. For the next step, get into pairs. One person will be the “Owner” and the other will be the “Collaborator”. The goal is that the Collaborator add changes into the Owner’s repository. We will switch roles at the end, so both persons will play Owner and Collaborator. If you’re working through this lesson on your own, you can carry on by opening a second terminal window. This window will represent your partner, working on another computer. You won’t need to give anyone access on GitHub, because both ‘partners’ are you. The Owner needs to give the Collaborator access. On GitHub, click the settings button on the right, then select Collaborators, and enter your partner’s username. 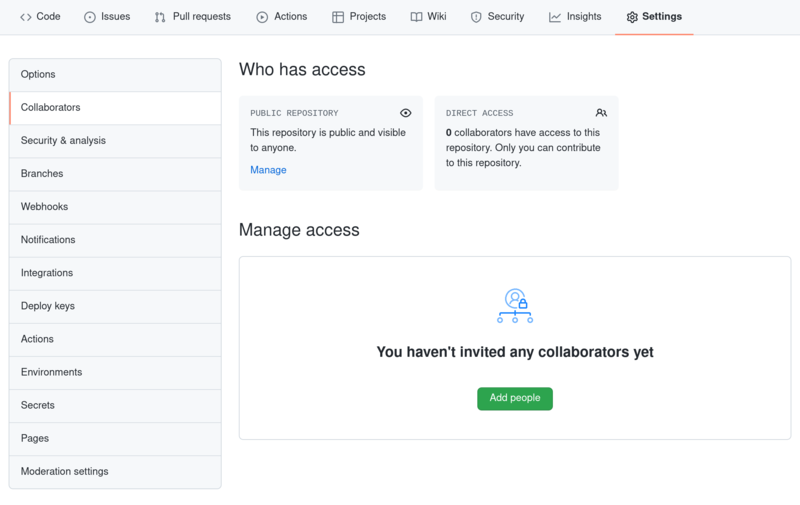 To accept access to the Owner’s repo, the Collaborator needs to go to https://github.com/notifications. Once there she can accept access to the Owner’s repo. Replace ‘vlad’ with the Owner’s username. It is so a planet! $ git commit -m "Add notes about Pluto"
In this episode and the previous one, our local repository has had a single “remote”, called origin. A remote is a copy of the repository that is hosted somewhere else, that we can push to and pull from, and there’s no reason that you have to work with only one. For example, on some large projects you might have your own copy in your own GitHub account (you’d probably call this origin) and also the main “upstream” project repository (let’s call this upstream for the sake of examples). You would pull from upstream from time to time to get the latest updates that other people have committed. Remember that the name you give to a remote only exists locally. It’s an alias that you choose - whether origin, or upstream, or fred - and not something intrinstic to the remote repository. git remote remove [name] removes a remote. Note that it doesn’t affect the remote repository at all - it just removes the link to it from the local repo. git remote set-url [name] [newurl] changes the URL that is associated with the remote. This is useful if it has moved, e.g. to a different GitHub account, or from GitHub to a different hosting service. Or, if we made a typo when adding it! git remote rename [oldname] [newname] changes the local alias by which a remote is known - its name. For example, one could use this to change upstream to fred. Take a look to the Owner’s repository on its GitHub website now (maybe you need to refresh your browser.) You should be able to see the new commit made by the Collaborator. Now the three repositories (Owner’s local, Collaborator’s local, and Owner’s on GitHub) are back in sync. It is better to make many commits with smaller changes rather than of one commit with massive changes: small commits are easier to read and review. Switch roles and repeat the whole process. The Owner pushed commits to the repository without giving any information to the Collaborator. How can the Collaborator find out what has changed with command line? And on GitHub? On the command line, the Collaborator can use git fetch origin master to get the remote changes into the local repository, but without merging them. Then by running git diff master origin/master the Collaborator will see the changes output in the terminal. On GitHub, the Collaborator can go to their own fork of the repository and look right above the light blue latest commit bar for a gray bar saying “This branch is 1 commit behind Our-Repository:master.” On the far right of that gray bar is a Compare icon and link. On the Compare page the Collaborator should change the base fork to their own repository, then click the link in the paragraph above to “compare across forks”, and finally change the head fork to the main repository. This will show all the commits that are different. The Collaborator has some questions about one line change made by the Owner and has some suggestions to propose. With GitHub, it is possible to comment the diff of a commit. Over the line of code to comment, a blue comment icon appears to open a comment window. The Collaborator posts its comments and suggestions using GitHub interface. Some backup software can keep a history of the versions of your files. They also allows you to recover specific versions. How is this functionality different from version control? What are some of the benefits of using version control, Git and GitHub?